Previously I’ve reviewed several ReadWriteThink apps. You may remember Word Mover and Trading Cards, Theme Poems, Alphabet Organizer and Haiku? Diamante Poem is another free educational app by ReadWriteThink. It’s a great way to introduce children to writing poetry because it supports them and gives them a concrete framework to operate in. 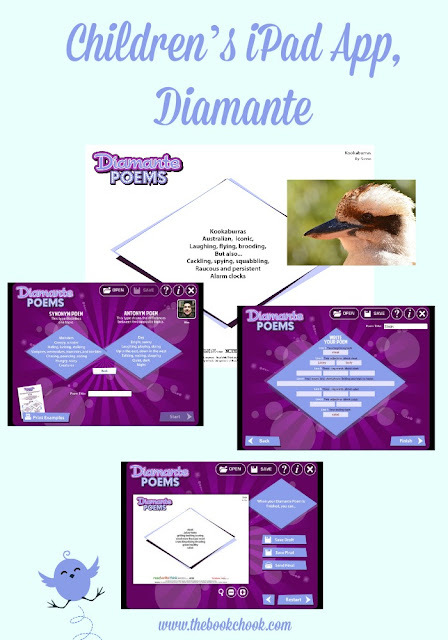 Diamante Poem is available as an online interactive, in iOS and in Android. Because diamante poems follow a specific format that uses nouns on the first and last lines, adjectives on the second and fourth lines, and gerunds in the third and fifth lines, this tool has numerous word-study applications. The tool provides definitions of the different parts of speech students use in composing the poems, reinforcing the connection between word study and writing. It also includes prompts to write and revise poems, thus reinforcing elements of the writing process. As usual this ReadWriteThink app is free, works well, and works straight out of the box. Diamante Poem is also great because it extends the simple concrete diamond shaped poem by offering both a synonym and an antonym poem. Again kids will feel confident because of the scaffolding in place - they are “walked” through each step of the process, including examples of printable diamante poems to use as models. Just as in other ReadWriteThink apps like Theme Poems, Alphabet Organizer and Haiku, children are encouraged to set up a profile, and are supported as they proceed through their poetry creation project. It is saved to the camera roll once finished, as a jpeg file. You may like to check out my iPad App Reviews on Pinterest, and find more apps and articles via my Listly page. If you’re interested in creating Poetry with kids, take a look at all my Poetry Resources.